Cory Catfish, also called Cory Cats, Cory Fish and Corydoras Catfish, are very popular freshwater fish in pet stores. Corys are hardy fish for their size and are staples in freshwater community tanks. Cory Catfish are often described as armored catfish, due to their plates of bone-like material running the length of their bodies. There are many different Cory Catfish types, all varying in size and color, but Bronze Cory Catfish are probably the most common. The good news is that Cory Catfish care is easy regardless of the type. Because Cory Catfish care is basically effortless, they are especially popular with beginner hobbyists. When buying Cory Catfish, look for fish that appear healthy, alert, active and moving. 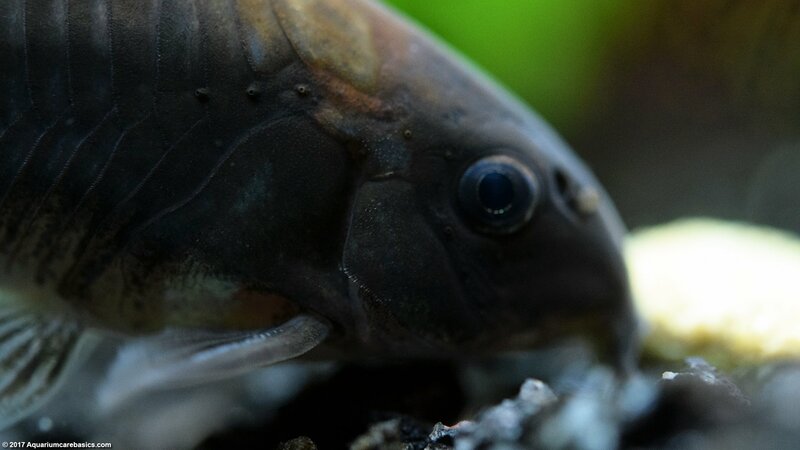 Make sure the Cory has both its eyes, and look to see that its fins and tail are not damaged. Also make sure the Cory has complete barbels on each side of its mouth. Barbels look like little whiskers. 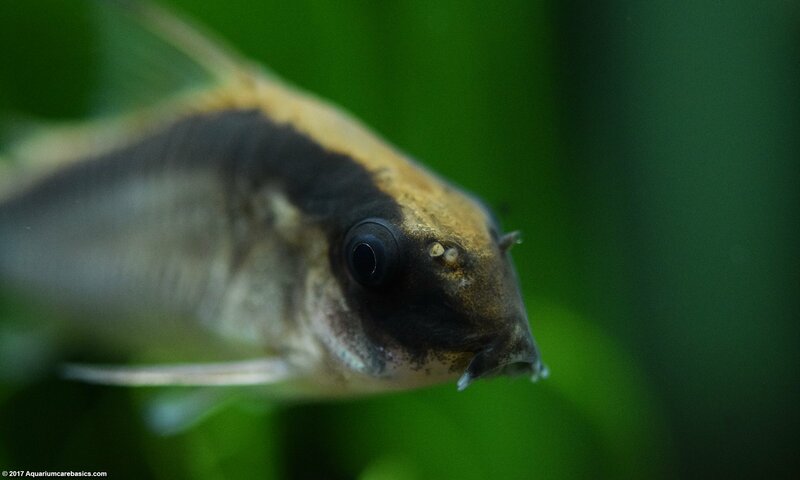 Sometimes Corydoras Catfish may be kept in display tanks with fish that nip at them, causing injury to the very sensitive area around their mouth. Avoid buying fish from display tanks with sick, diseased or dead fish. This may be an indication that the Cory Catfish may be unhealthy. One of the best things is that Cory Catfish care is easy. Corys have a calm, peaceful and non-aggressive temperament. Some Cory Catfish types are more shy and timid than others. This may also have something to do with their size relative to the other fish in the tank. It also can be related to the tank dynamic in general. 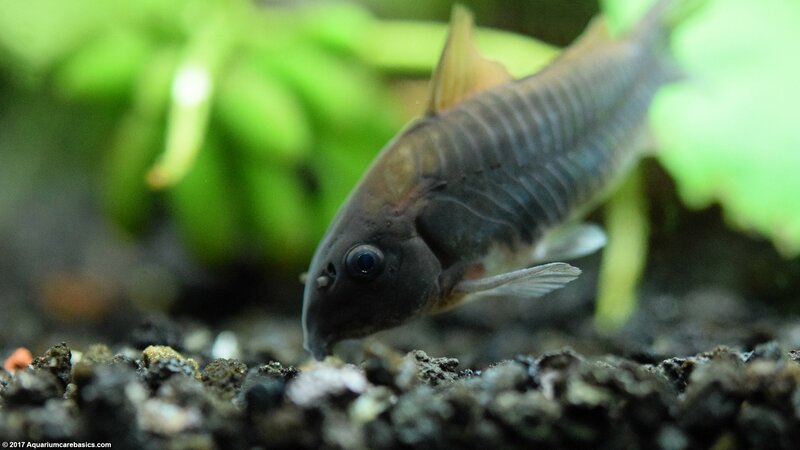 Corydoras Catfish are active and curious bottom dwellers, methodically scavenging the tank bottom looking some food to eat. Cory Catfish can be very active during the day, but they can also spend time peacefully resting motionless in the same spot. Corys may move about the tank at night, but they seem to be more active during the daytime hours. Tank Size: Cory Catfish can do well in covered tanks of nearly any size and dimensions. Many beginner hobbyists keep Corydoras Catfish in small tanks like 10 gallon aquariums. Cory Cats can thrive in larger tanks too. Either way, hobbyists need to remember that all living species tax the bio-load capacity of a tank. So it’s important to be mindful of fish count and overstocking. It’s also important to keep tanks thoroughly covered because Corys often dart up to the surface to grab a bite to eat or get a gulp of air. Hobbyists will often hear a snapping or popping sound as the Cory Cat breaks the water surface and moves quickly to the bottom of the tank. This is normal behavior and should not be considered a sign the water lacks oxygen, provided aquarium care is adequate. Cory Catfish School Together: Cory Catfish are very social creatures, especially with others of their kind. While Cory Cats can survive alone, they seem much happier in a group of two or more. Two Cory Cats of the same type will often stay close to one another as they move throughout the tank to feed. This is especially true when they rest. When one Cory Cat takes a break in the corner of a tank, other Cory Cats will almost always be seen an inch or two away. Two Cory Cats of different types may behave the same way. But in general, Corys of the same type seem to stick together most often. If aquarium size permits, Cory Catfish school in groups of six or more. Cory Catfish schooling behavior is a pretty interesting thing to see as the fish move throughout the tank synced like a precision dance ensemble. Habitat: A Cory Catfish is a bottom dweller, so it’s a good idea to keep at least 2 inches of aquarium gravel or substrate on the tank bottom. Cory Catfish also seem to really enjoy a tank with lots of live plants. Live aquarium plants provide cover and hiding places for the fish to rest. Finally, be sure to include rocks and decorations that provide places to explore. While aquarium pH and water temperature can extend beyond the traditional community tank range, its important to maintain stability. So avoid sudden shifts in conditions. Make sure Ammonia and Nitrite levels are kept at 0 ppm, and control Nitrate buildup with regular partial water changes. Poor Water Conditions: Cory Cats do not do well in tanks with poor water conditions. High Nitrates seem to stress Cory Cats and make them susceptible to diseases. Also avoid excessively stirring up the tank bottom while cleaning. This can release a large amount of decaying organic matter into the water column and start a bacterial bloom. The same goes for rearranging decorations. Corydoras Catfish may develop white patches around their mouths and barbels. This condition needs to be treated right away. If left untreated, Corydoras Catfish will stop eating, grow visibly thinner over time and eventually die. Cory Catfish diet includes basic food types including fish flakes, pellets and bottom feeder tablets. Corys will spend hours on end making their way across the tank bottom poking around for food. They will even move the surface gravel around a bit with their mouths, digging for more. 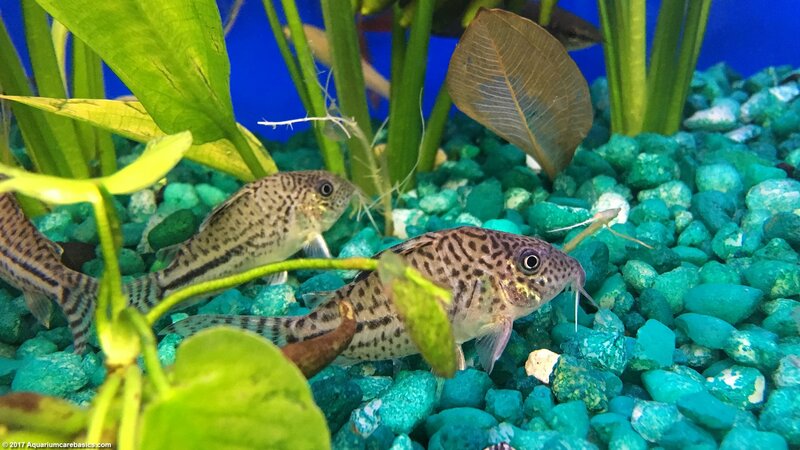 While their feeding ability makes Corydoras Catfish really good tank cleaners, they should not be considered a substitute for proper tank care. While Corydoras Catfish are adept at scavenging for otherwise uneaten food, the Cory Catfish diet cannot be mere left-overs. Left-overs may be in short supply so hobbyists need to make sure Cory Cats are getting their nutritional requirements met with supplements intended specifically for them. That said, avoid the temptation to overfeed. Only feed Cory Cats an amount of food that can be eaten in about 5 minutes. Durable and hardy, Cory Catfish lifespan can be long compared to other fish. 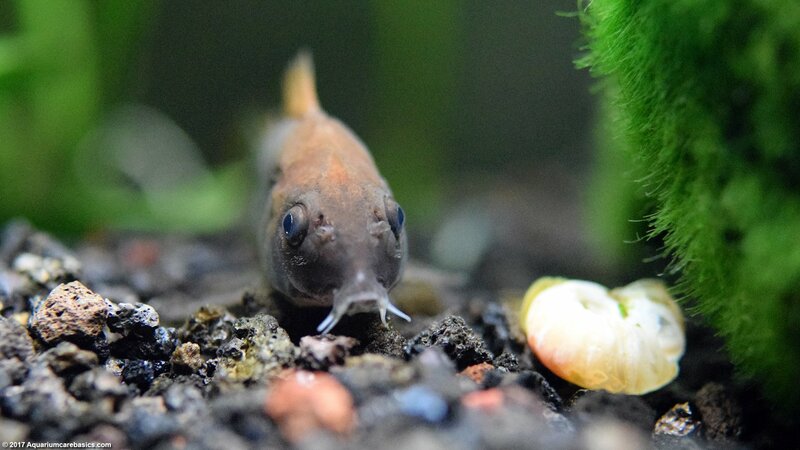 Cory Catfish lifespan can be 5 years, or significantly more, under the right conditions. That said, it’s not uncommon for some Cory Cats to die shortly after being added to a tank. This could be due to the stress of being transported or shifts in water parameters between home tank water and store display water. Corydoras Catfish are not as prone to this as the more delicate Otocinclus Catfish are, but it’s still a possibility worth mentioning. Cory Catfish tank mates include most community tank fish as long as they are non-aggressive and friendly in nature. Otocinclus Catfish, Tetras, Swordtails and of course other Corys can be a good fit. Cory Catfish tank mates can also include filter feeding shrimp such as Bamboo Shrimp and fan feeding shrimp like Vampire Shrimp. Cory Catfish tank mates can be Amano Shrimp, Red Cherry Shrimp and Ghost Shrimp. Freshwater Snails can include Gold Inca Snails, Ivory Snails, Mystery Snails, Ramshorn Snails, Pond Snails, Malaysian Trumpet Snails, Rabbit Snails, Japanese Trapdoor Snails and Nerite Snails. Cory Cats should not be kept with cichlids or aquarium crayfish. Roughens like Oscars, Texas Cichlids and Jack Dempsey can injure Cory Catfish, or may even eat them outright. Some hobbyists really enjoy keeping this small peaceful fish. Even though they are small bottom feeders, they can come across as very active, alert and entertaining to watch. And Corys can really be interesting as they feed and interact with different types of snails and shrimp. 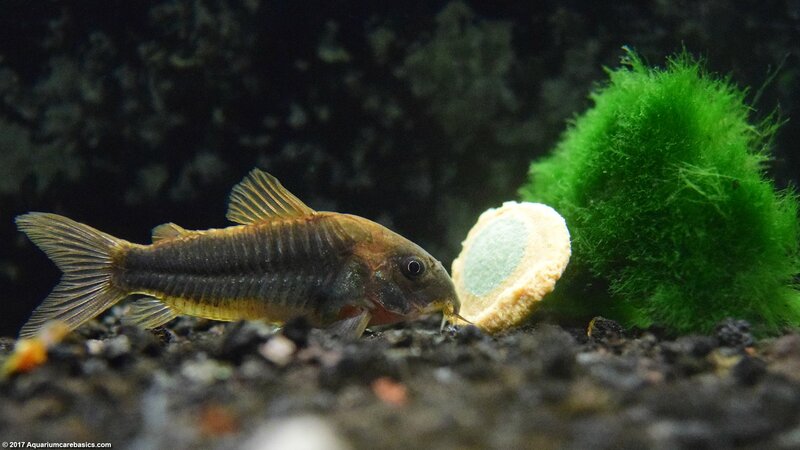 Its not uncommon for Corys to feed right next to their tank mates. They seem able to get along without scaring some of their smaller tank mates away. A group of different tank mates can hover over a bottom feeder pellet for a long time without incident. 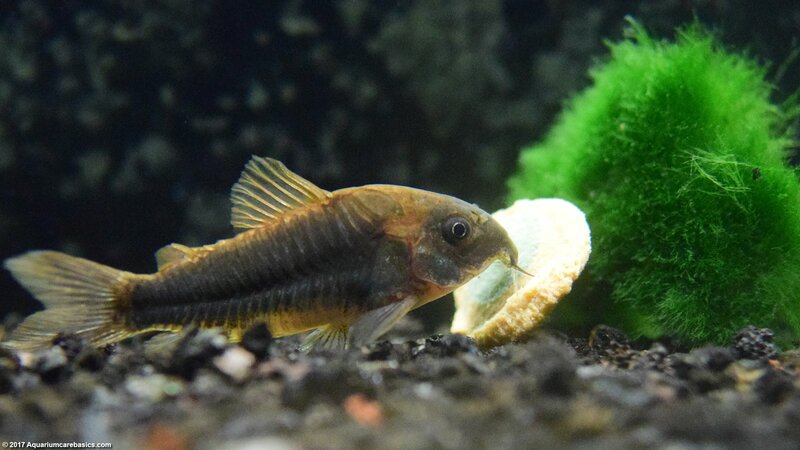 And Corys can even feed in close quarters with Otocinclus Catfish without spooking the Otto, which is pretty rare. Ottos are a delicate fish that almost always play it safe.